Which form vitamin B12 is best? What is intrinsic factor and how does it affect vitamin B12 absorption? How much vitamin B12 is in Dried Seaweed (Nori)? How Much Vitamin B12 is in Mushrooms? If vitamin B12 is only found in plant foods where do cows get vitamin B12 from? Vitamin B12 is an essential vitamin needed for proper development and functioning of the nervous system. A deficiency in vitamin B12 can lead to weight loss, constipation, and anemia. Numbness (tingling) in hands and feet may also occur in addition to depression, dementia, and memory loss. Since vitamin B12 is naturally found only in animal foods, vegetarians are considered an at-risk group for vitamin B12 deficiency. Fortunately, a wide variety of plant foods are fortified with vitamin B12. Further dairy, eggs, and cheese are all good natural sources of vitamin B12. Since vitamin B12 is well regulated by the body, and stores of vitamin B12 can be accumulated in the liver, there is no tolerable upper intake for vitamin B12. Below are the top 10 vegetarian foods highest in vitamin B12, for more see the lists cereals high in vitamin B12, cheeses high in vitamin B12, and the nutrient ranking of vegetarian vitamin B12 foods. See the full list of 200 Cereals High in Vitamin B12. As with all fortified foods, the quantity of vitamin B12 can vary, check labels for specific amounts, and see the full ranking of drinks high in vitamin B12. The quantity of vitamin B12 can vary greatly, check product labels. 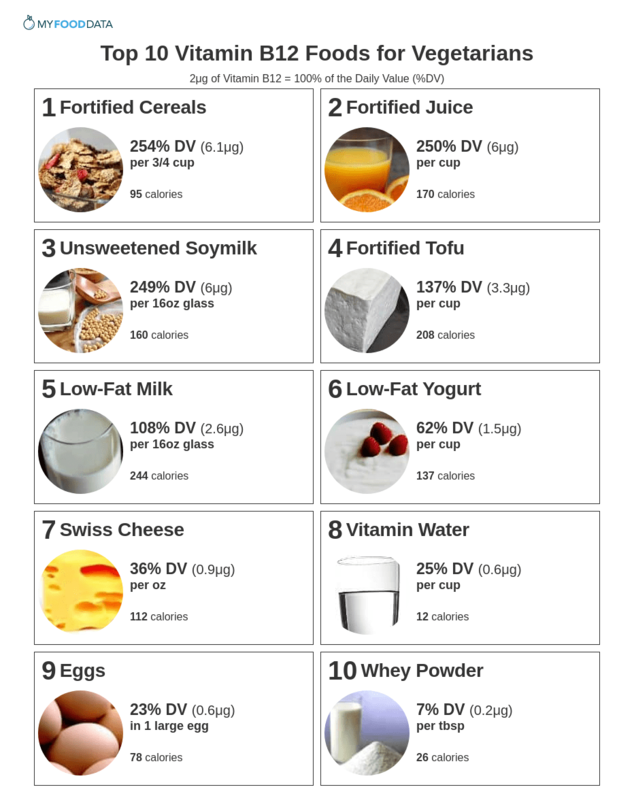 See the full ranking of dairy high in vitamin B12. Swiss cheese provides the most vitamin B12 with 36% DV per ounce. On average, cheese provides 15% DV per ounce. See the full list of cheeses high in vitamin B12. See the full ranking of drinks high in vitamin B12. Due to this factor, sometimes vitamin B12 is injected directly into patients, as opposed to supplements taken orally. These vitamin B12 injections can be a faster way to boost vitamin B12 levels and alleviate symptoms from anemia. Brewers yeast is used to brew beer and can be used to make bread. The amount of vitamin B12 in yeast is inconsistent at best, and so it can not be relied on as a source of vitamin B12 unless it is fortified. Interestingly a 12oz can of beer does contain 0.1μg or 1% of the DV for vitamin B12. Interestingly, some mushrooms do contain vitamin B12, but due to their inability to accumulate and store it, it is never a consistent or large amount. Cyanocobalamin is a common synthetic form of vitamin B12 used in supplements and fortified foods. While cyanide is present in this form of vitamin B12, it is not present in large enough amounts to be dangerous and is excreted by the body. Numerous other foods naturally contain cyanide, including almonds, lima beans, and spinach. Cows are not given any form of synthetic vitamin B12. Vitamin B12 is naturally synthesized by bacteria that flourish in certain animals (most animals actually, just not humans). Cows, in particular, ferment their food in 4 different stomachs as they digest it. This fermentation lets the bacteria in cows create vitamin B12, and allows cows to store any excess vitamin B12.